Experience the ease of a grab-and-go snack that is loaded with the healthy nutrition of cheese. At Scott's of Wisconsin we believe that healthy and convenient snacks and meals aren't mutually exclusive so we've come up with some clever ways to give you both. Our cheese snack containers are designed to respond to your needs and come in small, convenient 2 ounce and 3 ounce sizes for lunch boxes, picnics, desk drawers and even purses. The premeasured sizes also make them ideal for recipes. Once you've tried our cheese dips and snack cups, you'll want more. For even more convenience, try our Cheese N Go! with 8 mini cups of cheese spread you can grab one for a snack on the go; you can pack them into a lunch or carry several of them with you in case of a cheese emergency. 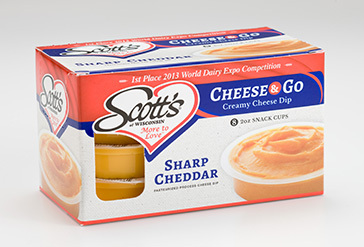 Scott's of Wisconsin always aims to please the customer, to this end, we are able to adjust the size of our Snack Cup containers to best suit your needs. We customize because it matters to you.